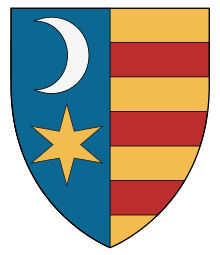 The Drăculești were one of two major rival lines of Wallachian voivodes of the House of Basarab, the other being the Dănești. These lines were in constant contest for the throne from the late fourteenth to the early sixteenth centuries. Descendants of the line of Drăculești would eventually come to dominate this principality until its unification with Transylvania and Moldavia by Mihai Viteazul in 1600. The line of the Drăculești began with Vlad II Dracul, son of one of the most important rulers of the Basarab dynasty, Mircea cel Bătrân. The name Drăculești is derived from the membership of Vlad II Dracul, "the Devil," in the Order of the Dragon (founded 1408). Marek, Miroslav. "A genealogy of the Drăculești family". Genealogy.EU.